If you’ve been aware of designer handbags for more than, say, the past day or two, you’ve seen your fair share of black and white bags. The sharp, modern color combination fits perfectly with the backlash against uber-trendy neons, prints and embellishments, which at times all appeared together on the same bag. (Of course, leave it to fashion to combat trend culture with a new trend.) Seemingly every designer under the sun has tried their hands at the look, but a relative handbag newcomer has beaten almost all of them with the Narciso Rodriguez Mixed-Media Envelope Shoulder Bag. Of course, Rodriguez has an advantage over a lot of designers in producing a handbag this sleek; his aesthetic has always been angular and modern, and although he’s best known for his immaculately tailored and ultra-flattering cocktail dresses, he’s managed to translate his talents to accessories in a particularly successful way. That’s something that most designers have a very hard time doing, and Rodriguez has done it quickly. He’s a man known for lines, and it’s the lines that make this bag successful; banding a black python and leather bag with a strap of white that not only breaks up the plane of the bag, but also serves as a functional slot for the bag’s tonal closure. In the best design, the lines are all there for a reason, and that’s something Rodriguez always remembers. 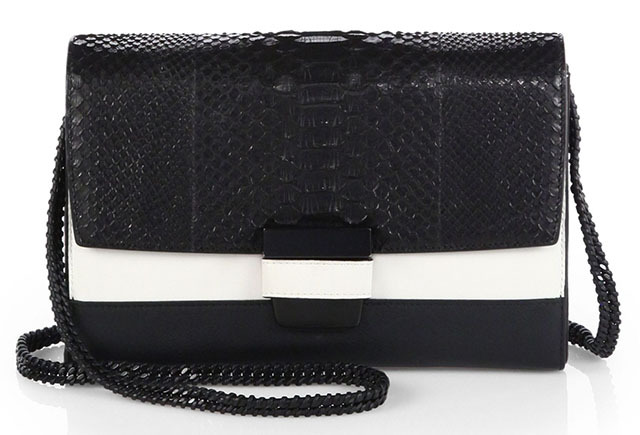 Pick up this bag for $1,895 via Saks.